Sunbury's accomplishments are rooted in his interest to learn new things and interact with different people. 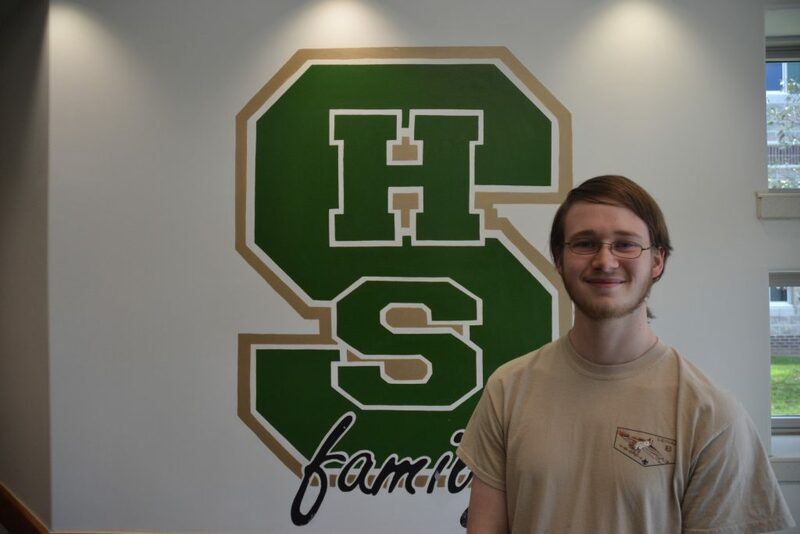 Robbie Sunbury, a senior at Seneca High School, is a member of the marching band, Robotics Club and pit orchestra. He plans to study electronics and computer engineering at Rowan University. After school let out and students packed their things to head home, Ronnie Sunbury could be heard playing the cello in the band room of Seneca High School. Staying later than most students wasn’t strange for Sunbury, and neither was hard work. As a senior, his schedule from the past four years at any given time could be consumed by scaling the ranks to become a first-chair cello in pit orchestra, a software lead in Robotics Club, or an assistant senior patrol leader in Shamong’s Boy Scouts. Sunbury received perfect attendance for the 2015-2016 year, went one season undefeated in Chess Club, was awarded a silver medal in the National Latin Exam in 2016 and 2017, and won an Orchestra Award the last three years, along with many other achievements. “Even when Robbie was a freshman, in a room full of musicians that were his superiors, he would shout out ‘I believe in you’ before someone took a risk or a test or anything,” said Doug Barber, a music teacher and one of Robbie’s most admired teachers. But Sunbury wasn’t always as outgoing as he is now. “I used to be one of the shyest people in like my entire grade up until about sixth grade,” said Sunbury. Back then, it was hard for him to find his place. He was taking classes with students who were two grades above his, and he never felt adjusted as a new kid from Pennsylvania. But he found his confidence after he made a joke with his teacher during class, which got him to open up in front of his classmates. 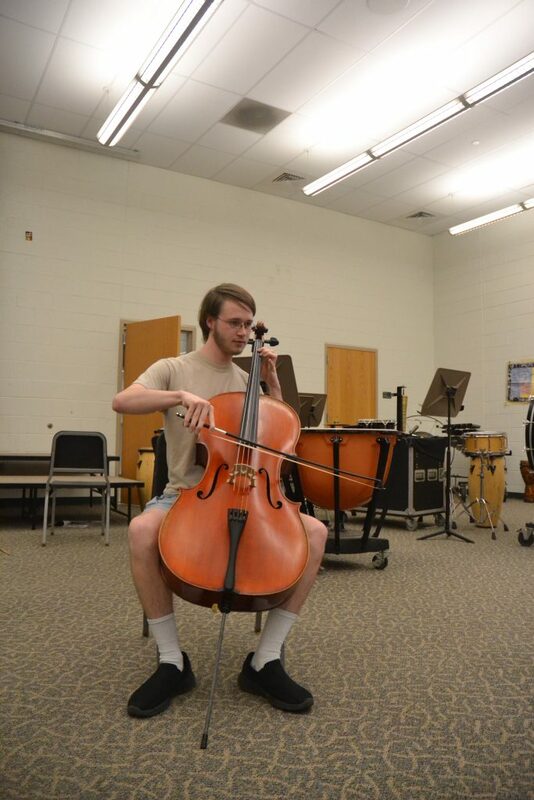 Robbie Sunbury plays his cello, named Sasha, after school in Seneca High School’s band practice room. “He is not afraid to let you know his opinion on things, and he always offers a different perspective to every situation,” said Jennifer Enos, one of his Robotics Club advisors. During one of the assignments for the club, Sunbury coded a tablet to control a robot so that the user didn’t have to use hand-held controls. It was so advanced compared to the other teams that he went over to teach them how to program the task. Sunbury had always been fascinated about how people could create things by using a computer. But it wasn’t until his freshman year of high school that he decided to take a coding class. Since then, he’s been a leading member of the school’s Iron Devils Robotics competition team, which has won multiple awards in both regional and national tournaments during his time on the squad. The Iron Devils were created during the 2004-2005 school year, shortly after Seneca High School opened. Over the years, the administration partnered with the Fortune 500 aerospace and defense corporation Lockheed Martin. The company provides the team with engineering expertise and mentors. Sunbury hopes to use this partnership to his advantage when he begins his college career. At the moment, he is committed to attend Rowan University for electronics and computer engineering, with plans to double major in computer science. He made clear that nothing is set in stone, but he has his sights on securing an internship with Lockheed Martin during college. But for now, you can find Robbie walking the halls with Sasha, his cello.